Aaron Auto Services has been around since 2008. In early 2010 Jessica and Drew Grey bought the business from Barry Gibbs, and continue to offer an technologically advanced and modern auto repair service with a hometown feel. July 29, 2013	(Newswire.com) - Aaron Auto Services has been around since 2008. In early 2010 Jessica and Drew Grey bought the business from Barry Gibbs, and continue to offer a technologically advanced and modern auto repair service with a hometown feel. Drew Gray oversees the various auto repair services Aaron Auto Services offers. Drew has a long history of building cars, Jeeps, and anything that has wheels. His love of cars and mechanics began as a young boy and he has always dreamed of owning his own shop. "My Daughter and I were on a trip to New York and my car broke down in Sevierville. I called AARONS and talked with Mrs Gray. She called her husband Drew to come get my car and then she drove to where I was to take me to my hotel. She offered to help me how ever I needed it, take me where ever I needed to go until I could get a rental car.I had to have major work done so I left my car there with them and went on to New York. He totally fixed my car perfectly and it got me home to San Antonio just fine. You will not find a better couple or a better car shop." 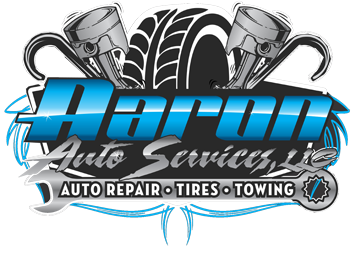 One of the best kept secrets of Sevierville is that Aaron Auto Services offers new and used tires. When families are stretched financially a flat tire or busted rim can add even more stress. Sometimes a set of new tires isn't an option. Aaron Auto Services offers safe, quality used tires in Sevierville. The Grey's have also began a new service of Business Fleet Maintenance for Sevierville and the greater Knoxville area. Their services include a custom maintenance schedule for businesses of all sizes that want to have dedicated, scheduled maintenance on their fleet trucks, vans, and other automobiles.